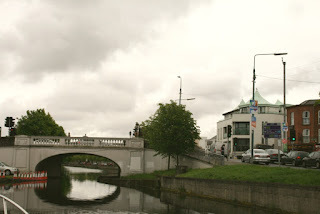 Retracing The Irish Waterways Journey of Thomas And Kathleen Roche - June 1927: 31st May - Lucan Bridge to Leeson St.
31st May - Lucan Bridge to Leeson St.
We awoke to a cooler drizzling morning, a bit of a surprise after several days of hot sunny weather. Weed filter cleared, water topped up, diesel checked, and we were all set for an 8:45 am departure to be on time to meet our Waterways Ireland escorts from the next lock into Dublin. 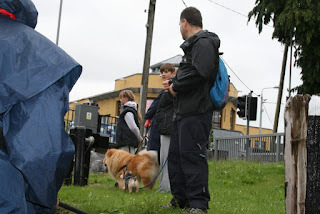 9:30 am, we arrived at Lucan Bridge lock 11, as arranged, and lock keepers turned up at 10:00 am. 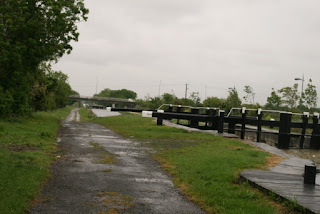 From here on it is a sequence of 11 locks that we had to get through as fast as we could as most lock keepers go home at 5 pm sharp. 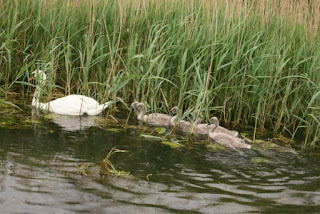 There is no overtime pay on the waterways, even we we tried to tip extra. 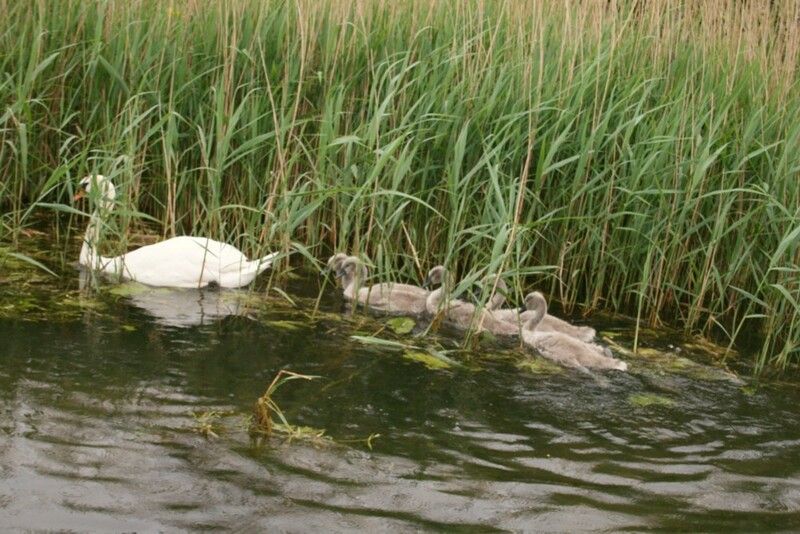 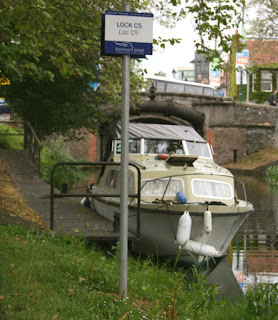 There seems to be a sort of work to rule protest going on within Waterways Ireland staff. 12:05 pm, we were as far as Cherry Orchard lock 8 and instead of warned hooligan, vandals and missile throwers we were greeted by lots of friendly interested people. 1:10 pm, we reached Inchicore lock 5 and still going strong, though more and more weed was intering and blocking our weed filter so frequent cleanings were essential. At this point two beautiful classic house boat barges passed us in the opposite direction. 2:05 pm, we gave a bit of a chear as we passed lock 1 just before Dolphin's Bar not far from Heuston Station and the Guinness Factory. 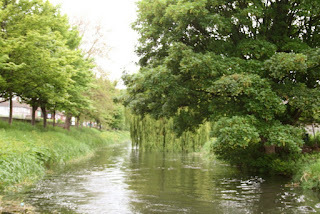 3:30 pm, within lock C6, just leaving Portobello, the boat would not start indicating the that prop was stuck. 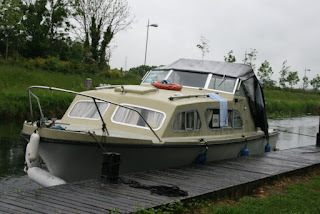 We hand pulled the boat out of the lock and, again, Claire investigated in the water. 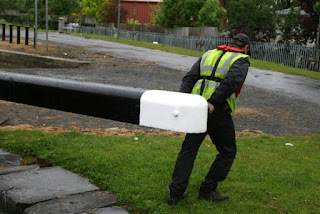 Alas a duvet was wrapped around the prop, no minor task to tackle with a kitchen knife. 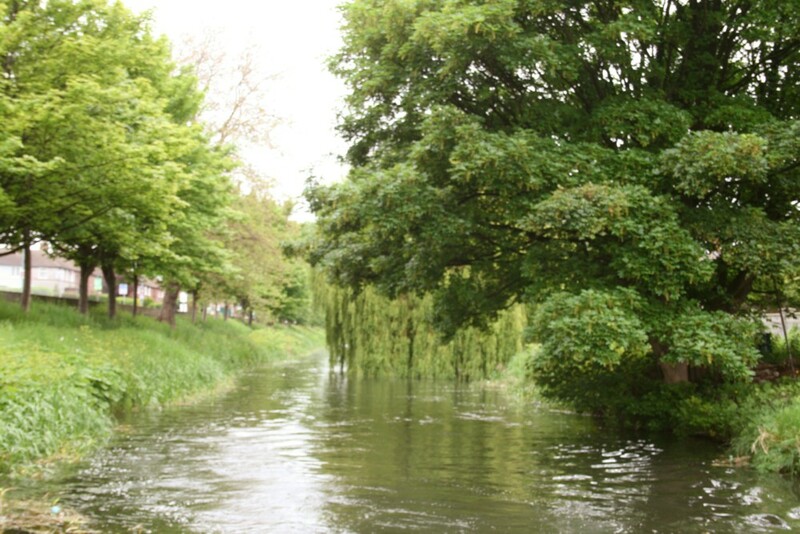 This needs someone with a wet suit and cutting tools. Alas, this determined we were not likely to make it to Grand Canal Dock tonight. 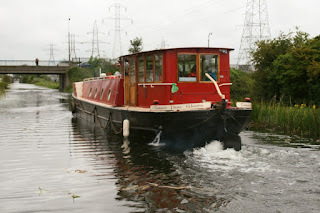 6:45 pm, there was an offer of a tow to just beyond the next lock by the skipper of the Guinness night club barge that was going that way. 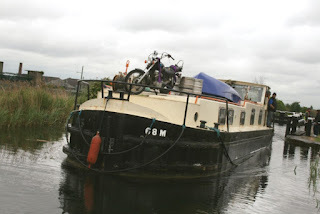 This barge tow took us to the next lock, that we had to work ourselves after the Guinness Barge had passed through it. This was actually the first time we had worked a lock for ourselves. 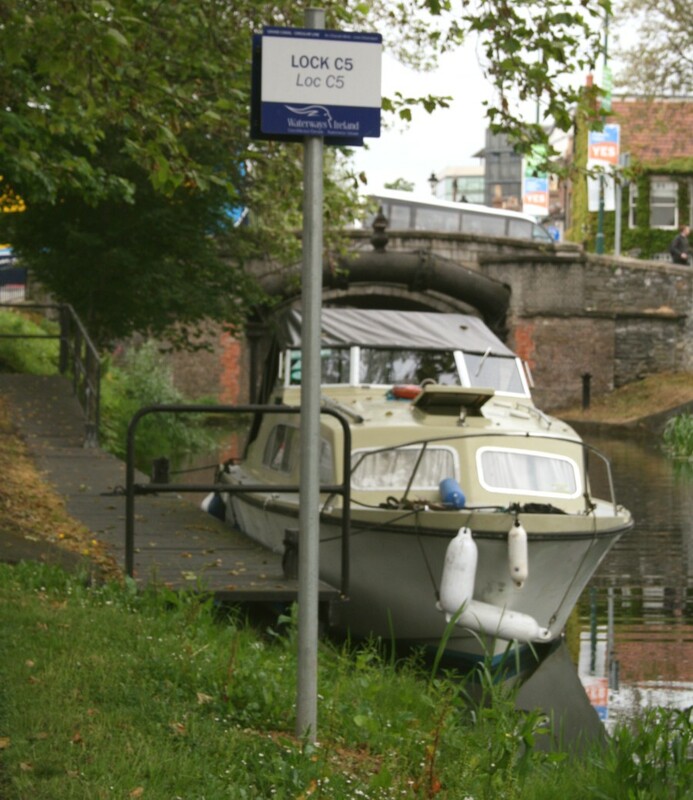 7:30 pm, we were settled into a lovely canal side mooring between Leeson St. and Baggot St. 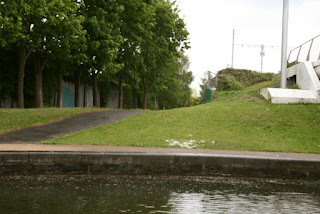 Curiosity abound, I then went for a walk to see how far we really were from Grand Canal Dock. I think its just over 1km in total. 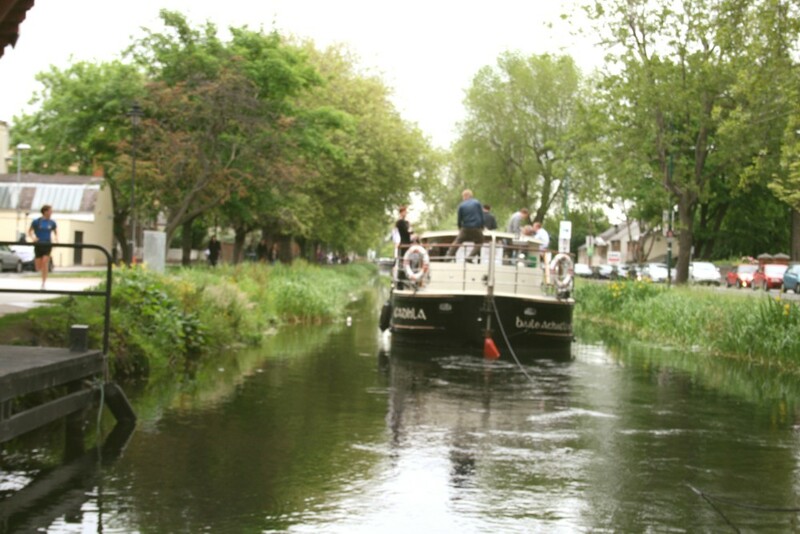 ... so Claire and decided to pull the boat, like the old horses, from Leeson Street to Grand Canal Dock in the morning as there would be be divers and mechancis on hand to help us out through Friday and Saturday.